Being a pizza blogger has been far more interesting to me than I have ever imagined. I have so much fun doing what I'm doing, but the popularity of this blog, and the interest that people take in it is really humbling. I don't see myself as that interesting or exciting of a person, but people are interested in the blog and constantly ask me questions about just about everything pizza related! This article provides a few of the questions that have been asked, and I will update the FAQ's with any interesting questions that come up. Please do email me or ask in the comment section below if you have any more questions that you would like to see answered! How did you get started with the blog? I have always wanted my own website, and I had been thinking about it for years, but never really knew what to create. I wanted something unique and that I had a passion for. Really there were 3 topics I wanted to write about: sports, technology (cell phones, laptops), and pizza. The first two topics are already well covered and I could never do as well as the ESPNs and Engadgets of the world, so I went with another area of interest - PIZZA! I also wanted to start up this website in conjunction with starting my masters program, which was really the thing that finally got me started on this path. I was a full-time pizza maker for over a decade at several different pizzerias in Northeastern Pennsylvania through High School and College. My educational background is in Business. I currently work full-time in a non-pizza related field, but still make pizzas both at home and as a fill-in once in a while at a local pizzeria. The pizza review website is truly a hobby of mine which I enjoy. I eat, review, write, edit, publish, promote, and talk to my audience on nights and weekends. I will say that the website does cause me some late nights, and has basically eliminated my TV watching and other extra-curricular activities! Having a "mobile office" with my Samsung Galaxy Note 10.1 also helps me be more efficient. How much pizza do you consume in a given week? On heavy weeks, I've been known to eat pizza 7 days per week. This includes initial pizza reviews, frozen pizzas, and leftovers. On a light week, I will eat pizza twice, but I usually have pizza closer to 4 days a week on the average. Don't you get tired of eating all that pizza? No! I thought for sure I would have hated pizza by now, especially since most times I order plain cheese pizza. In reality, I love it more than ever. I think what I like most is finding the different incatricies of each pizza, finding what's similar to other pizzas, and what's totally unique. Each pizza really tells a story, and I very much enjoy trying to capture that story with every pie I eat. What is it like going on a review? This is probably the most popular question I get, and to be honest, it's not very exciting. It's really like going out to eat with any other person, except one of the topics of conversation is how we like the pizza, and what we think of each component. Where it gets a little strange is when I take notes of what my friends have to say and take pictures of the pizza. I'm sure when I'm off by myself, I look much more alarming since I'm undercover, but in my mind, I think I appear like a guy eating pizza and catching up on his emails. I could be very wrong though! Have you even been caught doing a review? Yes, several times, and it's quite awkward. I usually get caught taking pictures, and when approached, I usually make up an excuse like "Oh, I'm just letting my buddy know I'm here - he said it was a good place." I'm a terrible liar, but I never tell the person what I'm doing until after the review because I don't want any special treatment! I want as real of an experience as possible. What is your goal with the website? For now, this is purely a hobby so my goal is for my following to grow and for more people to read and benefit from the website. I want my site to be more interactive where people challenge my opinions and get talking about pizza! The more content we have, the more useful the site will be to NEPA residents. Ultimately, I would not mind finding a way to pay for all of the traveling and cost of pizza without compromising the integrity of my blog. Why did you create pizza570.com? My mission is to inform people of what pizzas are great and which pizzas they should skip in the area, and to get people talking about pizza in general. Many people don't have time to read a full page text review, and just want to get to the bottom line so I took that concept, and created a more streamlined website that has more pictures, replaces paragraphs with captions, and allows readers to do the ratings just like you can on any other social media review site. Pizza570 is really about giving people another option to consume the information as they desire. Both websites will always be available, and it's up to you which one you want to use - I prefer you check out both because they both offer different information and pictures, not just a condensed review! 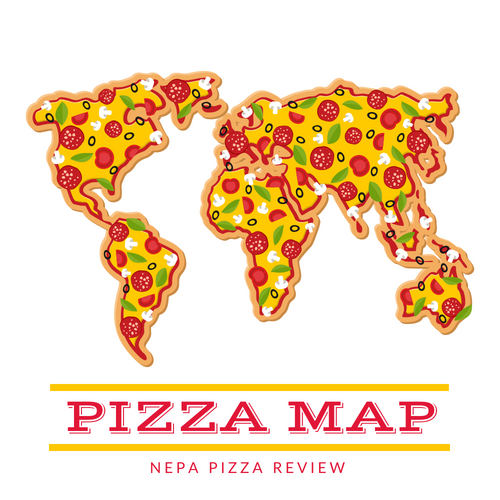 What is the best pizza you have ever had? Well, now wouldn't that just be too easy for me to say here! You will have to read my reviews, ratings, and rankings to find out for yourself! Do restaurant owners ever get upset with you? In short, yes. Although I never want to "rip" a pizza, and try to be constructive even when I give a pizza a low rating, I always try to point out the positive. Restaurant owners take a great deal of pride in their product and are sometimes insulted by what I have to say. I have an open invitation on my Contact page for restaurant owners to invite me back for a second try if they think I'm being inaccurate. In fact, I've already had one or two owners take me up on that! What do you like most about pizza blogging? Definitely interacting with my readers. Without an involved audience who tweets, emails, facebooks, comments, and spreads the word of mouth, I would not exist. A close second is my new hobby of introducing myself to the owners of the pizzerias after I'm done with the review. We get into some lengthy conversations which are so interesting. Absolutely. When I tell friends and acquaintances about my website, they kind of go "oh yeah yeah yeah, sure" and blow off the idea. Then someone else will tell them about the site, and when they finally see it an use it, it's like an awakening for them. I'm not an "I told you so" kind of guy, but I am happy when someone can get use out of the reviews! Restaurant owners are also skeptical, but once they see my body of work in its entirety, I think they generally (not all) accept my opinion even if they don't agree with it. New York Style. Before you say shun my credibility and say I should love Old Forge Pizza if I'm from NEPA, pump the breaks for a minute, because I do love Old Forge. I also love just about every type of pizza there is. My least favorite happens to be white pizza, just because I'm a sauce guy, and tomatoes are very important to me! I believe I can still objectively review a white pizza however. How do I write my reviews? Well, I use the handy Samsung Galaxy Note 10.1, which is amazing for keeping all of my blogging tools, social media, emails, and everything I need organized! I highly recommend one! Check out the Amazon link below to get one for yourself!